Part of our mission is to connect community residents with local food producers and we want everyone to have access to the fresh, local food available at the Midtown Farmers Market. Stop by the market tent to convert your EBT cards to tokens that can be used to make purchases throughout the market. Accepting EBT is popular with our vendors and with our customers. Our vendors are able to provide fresh, affordable food to the community and our customers are able to feed their families with better, healthier fruits and vegetables by using their EBT benefits. If you have any questions about how to use your EBT benefits at the Midtown Farmers Market, please stop by our market tent. As a way to make it easier to purchase fresh, local meat and produce, we are pleased to be able to offer another year of Market Bucks. Market Bucks is an incentive program which encourages EBT recipients to use their benefits at the farmers market. Customers making purchases with EBT cards can receive up to an additional $10 in Market Bucks each market day. 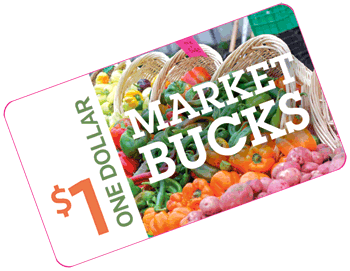 Here’s how it works: Once per day, when you use EBT to make a purchase at the market, you will receive up to an additional $10 as a Market Bucks coupon. The Market Bucks can be used in the exact same way as EBT and essentially double the purchasing power of that first $10. This project is supported by the Minnesota Department of Human Services and funded by by Blue Cross and Blue Shield of Minnesota. The Midtown Farmers Market is proud to be the first market in Minnesota to provide the community with this service. Since 2006 we have made it easy for Minnesotans who receive food support through the Supplemental Nutrition Assistance Program (SNAP) to purchase healthy, fresh and local foods. The Midtown Farmers Market helped pilot the use of EBT at farmers markets in Minnesota. This program has been such an overwhelming success that it is now being emulated across the state. As of 2014, 63 farmers markets in Minnesota accept SNAP-EBT.